Victorian-style Boutique Hotel with Exceptional Service & Great Dining. 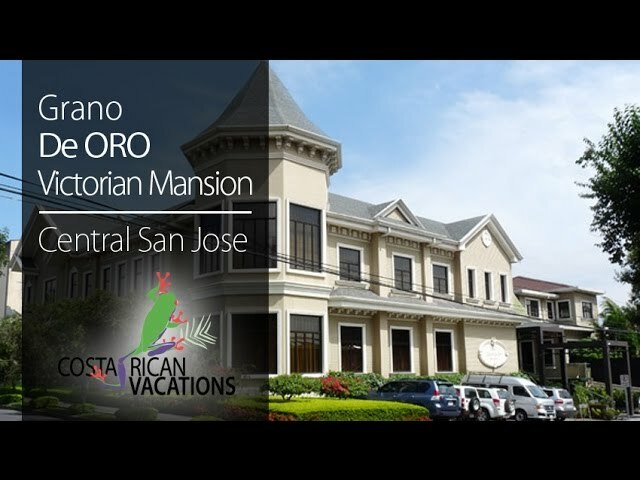 In the heart of San José, the famous Grano de Oro Hotel is a surprising oasis in the concrete jungle of the city. Grano de Oro is a beautiful option for families, couples, and anyone looking for boutique-style services and luxury accommodations in downtown San José. The hotel offers 32 bright and airy guest rooms each with furnishings that echo the tropical-Victorian characteristics of the original historic mansion. Wrought-iron, deep hard woods, and rich fabrics adorn the various rooms. All rooms are equipped with A/C, cable TV, mini-fridge, safe, hair dryer and coffeemaker. The hotel also includes complimentary WiFi throughout the property. While Grano de Oro doesn’t have a swimming pool, guests can enjoy two Jacuzzis on the rooftop garden terrace. The hotel partners with a massage service, Aromas Tropicales, and treatments can be arranged at the reception. Grano de Oro Restaurant is consistently rated as one of the best in the country, and we recommend enjoying at least one meal there during your stay. Their wine list is extensive and outstanding. The gorgeous indoor/outdoor dining area offers ample seating, or guests can pull up a stool at the indoor/outdoor fully-stocked bar. The menu offers a variety of Costa Rican fusion dishes with European influences from their French chef. They are open for breakfast, lunch and dinner. Special diets can be accommodated with notice. Service here is paramount, as one can note from the perpetually smiling staff who welcome guests. All rooms are designated as smoke-free. The hotel’s piece de resistance is the Vista de Oro (Golden View) Suite—reached by private staircase, the suite lives up to its name commanding a breathtaking view of the Cordillera Central mountain range and the Central Valley skyline. The rooftop garden offers a Jacuzzi and sunbathing patio with gorgeous city views. The Grano de Oro restaurant is one of the finest in the city, serving continental cuisine in an intimate, partially open-air atmosphere, with an award-winning wine cellar. This eco-friendly, sustainable hotel works with reforestation projects and local farmers. It is also certified through the Costa Rican Tourism Board with a Level 5 (highest available) CST (Certificate of Sustainable Tourism). At the hotel reception desk, activities and day tours to Costa Rica’s beauty spots are readily arranged. A few of the more popular excursions include the following: San Jose City Tour, Café Britt Coffee Tour, Jade Museum, Pueblo Antiguo, Pre-Columbian Gold Museum, and Butterfly Farm. Located near San José main park, La Sabana, it’s perfect for those wanting to take an early-morning run.